Wrestling started out as a spur-of-the-moment game. It eventually became more popular during festivals, when people from different provinces would compete against each other. 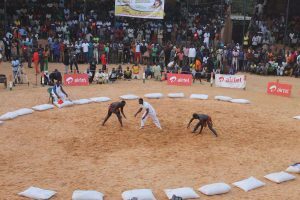 Sorro wrestling originated during these occasions, and it is practiced only in Niger. The aim is to get any part of the opponent, besides the feet, to make contact with the ground. Competitors play against every other competitor, and the one with the most wins is declared champion. Nigerien Youth Week, a national youth sport and cultural contest, has made wrestling extremely popular. Prominent leaders began to promote wrestling to encourage national unity, organizing tournaments during harvest festivals. In 2015, Niger won an African Traditional Wrestling Tournament, triumphing over six other countries. A vast plantation is Kassou Dan Tune! What belongs to us is ours indeed. If fortune smiles on us. The day that Salma got himself trapped. For a whole hour Kassou stood upright. Suddenly, they charged at each other. Or yet with a marabout. But the strength of Kassou is not that of one man alone! The wrestler himself also chants a kirari (self-praise), perhaps wearing a gris-gris talisman for luck and strength. Many competitors strongly believe in charms and incantations, spoken as they enter the arena. A fathia (prayer), is offered, and the Minister of Sports gives a speech, speaking of peace, cultural identity, and friendship. The winner receives a monetary award, a boubou robe and turban, a horse, and the ceremonial saber. Both winners and losers receive kari (gratuities) from the audience. Wrestlers compete more for the game itself rather than the award, and often share money with griots and inexperienced wrestlers. This year’s winner was Tassiou Sani, representing Zinder. The tournament will continue next year, carrying a cultural tradition reflective of Niger’s unity, strength, and resilience. Lack of access to clean water negatively impacts many communities in Niger, including the Tuareg people, a nomadic tribe that inhabits the Sahara Desert. This ancient African tribe has been popping up in the news recently due to their involvement in uprisings and with various rebel groups. Although the reasons behind these rebellions are complicated, an undeniable exacerbating factor is the competition for natural water on their indigenous land. The Tuareg have lived in the water-scarce Sahara Desert for centuries, but a mix of climate change and the increased water resource exploitation has seriously impacted their ability to survive in their indigenous homeland. A very brief background of the Tuareg: dating back to as early as the 4th century, the history of this tribe is vibrant, complex, and has been influential to modern Africa. Traditionally nomadic, the clans traveled throughout their indigenous home of the Sahara Desert living off of resources and their livestock and were heavily involved in trans-Saharan trade. By the 19th century, there were quite a few clans split throughout their indigenous Sahara region, and these tribes were some of the strongest opponents to French colonialism. Once African countries gained independence in the 1960s and the modern country borders were established, the Sahara Desert (and by extension the Tuareg) had been split between 5 nations, a majority of which (around 2 million people) currently live in Niger. Niger – Agadez – Young Tuareg girls holding a water bucket on their heads. One of the major challenges the Tuareg are currently facing is the depletion of water in the already resource-sparse Sahara Desert. In Niger, the Tuareg are a marginalized group and have little economic or political power. Their homeland is also rich in uranium, a prized metal that is sought by many nuclear companies. According to the University of Texas’ Climate Change and African Political Stability research, this uranium has led to serious conflicts between Tuareg tribes, the Niger government and the French company who currently mines the area. As the report states, uranium mining “is water intensive, both in underground and open pit operations, and Niger has both.” This has led to a major depletion of water resources, and access to clean water is becoming increasingly limited. Although the French company has stated they are incorporating water-saving updates that will lessen the amount of water taken from mining, with new mines being developed and other environmental issues involved when extracting uranium, the Tuareg are desperate for autonomy and ways to ensure their continued access to clean water. With the actions of Wells Bring Hope, vitally important access to water is being brought to Tuareg and others living in the water-sparse areas of the Sahara Desert. As CCAPS research indicates, “adaptation to increasing water scarcity need not be high tech or guided by national-level policy.” Empowerment through access to clean water has a significant impact on individuals and communities. This will help not only the survival of these clans but will also impact relations between the Tuareg, neighboring towns, and the government of Niger through easing the burden and fear of not having access to a clean water. Every year, art collectors, admirers, and enthusiasts gather in New York during the first week of March for one of the world’s leading contemporary art fairs, Armory Show. An important event for the art world since 1913, this art fair has become increasingly interested in how technology and culture contribute to the art we view and how it is consumed and revered around the world. Known for his mixed media paintings, Omar has been a student of the arts for most of his life. His work marries reality and surrealism in scenes of violence and fantasy from the present, folklore, and dynasties dating back to ancient Egypt. Ba has moved from his origins of abstract painting and now draws from his multicultural experiences to use figurative art as his storytelling medium. Lina’s art can be distinguished from other artists’ from a mile away, with a very technique and time-consuming process seen through the detail of each painting. Her signature use of resin coated in 24-karat gold leaf on blue, black or white backgrounds has gained the attention of artists across visual and music mediums. 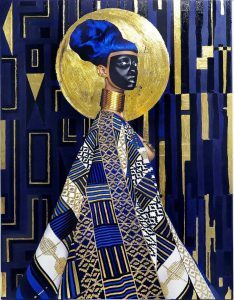 The artist has explained that she uses these materials to reference the sacred way that gold was used by ancient cultures, and reaffirm the wealth and richness of African heritage. 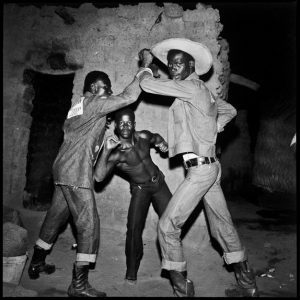 Keita’s eloquent photography has captured a crucial time of transition for his hometown, Bamako – the capital of Mali. 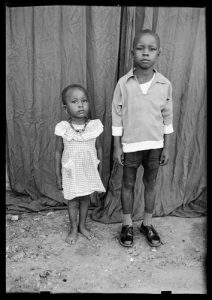 After receiving his first Kodak camera at the age of 14, Seydou spent the rest of his life as an artist teaching himself the techniques of shooting and printing by taking portraits of those in his community. 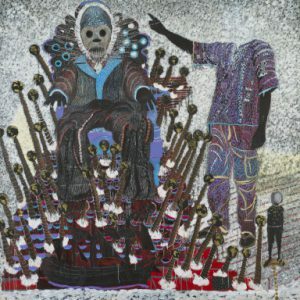 Although Keita passed in 2001, his art is gaining popularity for its insightful storytelling of a country in political transition through imagery that seamlessly blended formality and intimacy. Jade is the youngest artist on this list, with her very first solo show happening earlier this year. 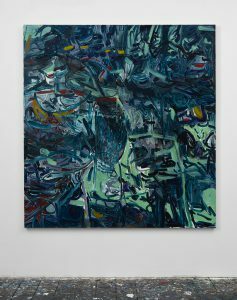 Using juxtaposing vocabulary to define her artistic style, Jade explains that she aims to create “locations of familiar unfamiliarity, fears, and unknowns, my paintings delve into how we use the sense of place to establish our identity”. To go from her first solo show to a stage as big as Armory Show, this emerging artist has an awesomely bright future ahead. In 2013, I had a unique and life-changing experience. For most of the year, I volunteered at an orphanage school in Buea, Cameroon. No, it was not a mission trip or a study abroad year. No, I did not go with friends or family. No, I did not know anyone there. When I share this experience with people, they look at me in awe. They’re usually appalled that someone would give up their savings and time to travel to a 3rd world country. Most people label me as brave, but I didn’t feel courageous. In fact, if I’m being honest, I felt a certain amount of anxiety run through my body. Although difficult to explain, I will try my best. I felt a calling since I was a child. Africa was a fascination to me, and I felt compelled to visit. My childhood was by no means easy, but I can’t imagine struggling for food and water. I wanted to assist those who didn’t have access to these basic necessities, and I felt like this experience would be meaningful. I was going to a place where water was scarce, a cherished rarity. When in Cameroon, it common for the government to turn the water off, and for the community to have to make do with the little they had. When I stayed there for a year, I conserved water in a large bin, not knowing when the water would be turned back on. In anticipation of this event, we would prepare by trekking to a well under the scorching sun. I needed water because I was often parched and dehydrated thanks to the sweltering African heat. I would trek three miles from the school where I was volunteering with my cherished bottle of water in my bottle in hand. I did my best to conserve my water use each day, but I had a host mother close by. 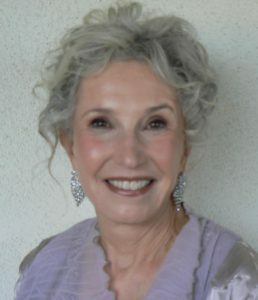 I would often visit, and she would cook her usual meal of rice and beans. It was a difficult meal to cook because water was not always available. There were various buckets for cooking, drinking, and bathing. Warm water was out of the question. I would normally stand in the bathtub and rinse off soap with water, chilling my body. It sounds uncomfortable, but really it was refreshing. To shiver from the frigid water, then to get dressed and go outside to face the angry African sun was an unforgettable feeling, like a tug of war for my body and mind. I was fortunate enough to be able to afford bottled water, selling at 10 cents each. To people who receive 50 dollars each month to support their entire family, this option is out of the question. As a result, sometimes they would drink stagnant water or water that was contaminated and hope they would not fall ill. If that happened, then they need to get medicine which they cannot afford. As a result, they missed work. If they had access to clean water, none of this would have been an issue. Upon completion of my volunteer experience, I returned home with a mix of bliss and joy. My broken heart alternated between sadness and happiness. I felt fortunate not to worry about water. In my hotel, I made a mad dash for the shower where I took a long, boiling shower. The hot water pouring on my back felt foreign after nearly a year. I was also racked with guilt. I stepped out of the shower with the steam enveloping me like a warm blanket, fighting angry tears to stop them from pouring. I knew my perspective on water had changed. My habits changed from then on. When I brush my teeth, I turn the water off. I have a timer in my shower to limit my time to five minutes. These are small changes that don’t solve the global problem, but I know I’m making a difference by conserving water locally. U.N. Water, which coordinates the annual World Water Day campaign, reports that there are over 663 million people in the world living without a safe water supply close to home, spending countless hours queueing for or trekking to distant sources, and coping with the health impacts that come with using contaminated water. 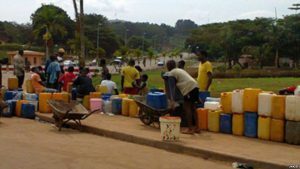 This is according to Water Shortages Plague Major Cameroon Cities. I often read articles like that to remind me how lucky I am. We take accessible water for granted. I am thankful I had the opportunity to experience living with water scarcity. I wish everyone did. Malnutrition takes many forms. Did you know that you can be both overweight and malnourished? While many children today in both developing and developed countries are malnourished and overweight as a result of fast food culture, Africa is still overwhelmingly plagued by malnutrition in the form of stunting, wasting, and being underweight. Stunting (insufficient height for age), wasting (insufficient weight for height), and being underweight (insufficient weight for age) are the main factors of child growth failure (CGF), which is a fundamental impediment to human capital development. 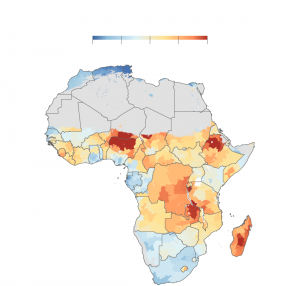 A study published in a recent issue of Nature collected data from 2000 to 2015 and found that while almost all countries in Africa have made overall progress on improving children’s nutrition and health, there are still many disparities between regions, even those within a single country. In particular, researchers found that CGF was notably prevalent in the Sahel region, which is a semi-arid area that includes southern Niger. Many worldwide humanitarian organizations recognize the need for action on behalf of children in Africa and have set goals aimed at motivating policy change. In 2012, the World Health Organization (WHO) established the Global Nutrition Targets, which aim to improve nutrition for all children under five by the year 2025. In 2015, the United Nations (UN) adopted the Sustainable Development Goals, which include an objective to end all forms of malnutrition by the year 2030. While the study in Nature projects that all countries in Africa are on course to meet the WHO’s targets for improved nutrition, none of them are expected to reach the UN’s goal to abolish malnutrition completely. Though some people might consider the goals of the WHO and the UN to be ambitious, both organizations have outlined clear paths toward attainment of these goals. The WHO has come up with a series of five action plans for country officials and policymakers to undertake, most of which include the creation and maintenance of policies, interventions, and programs that support and promote nutrition and healthy eating. Meanwhile, the UN has recommended that countries allocate more funds for social programs and increase investment towards sustainable agriculture and food production. The issue of malnutrition is, of course, one that is closely tied to water. The most common result of drinking contaminated water is severe diarrhea, which means that even children who have access to sufficient calories and nutrition can become severely malnourished if not provided with clean drinking water. A lack of clean water and hygienic conditions also make children more susceptible to illnesses that result in stunted growth. The availability of drinking water in many regions of Africa is threatened by the severe droughts, and global warming is exacerbating this already dire situation. Clean water must be prioritized for small children who are the most vulnerable to water-borne diseases. Otherwise, UNICEF warns, as many as 600 million children could face malnutrition, disease, and death by the year 2040. When we drill a safe water well in a village, child mortality drops by 70% thanks to the combination of clean water, adequate sanitation, and the improved nutrition made possible by vegetable gardens. The answers aren’t complicated; we just need the will to implement them. We can end the world water crisis and child malnutrition in our lifetime. Money adds up. As someone with a sweet tooth, I probably spend about $7 each week on sweets, sometimes planned, usually on a whim. I got curious about how much money that adds up to over a year: $336. Look, I’m not willing to cut sugar out of my life. I’d fight off anyone who tried to bolt with my ice cream. But for something that lasts a few minutes and really isn’t all that healthy, cutting out a little wouldn’t hurt. We have a lot of resources that can be easily taken for granted, so much so that we sometimes overindulge. Indulging isn’t a bad thing, but there is a limit to how much pleasure we can get out of something. Once your cup is full, let the rest flow into someone else’s. One simple way to do this is by keeping a spare change jar. I’m irrationally bothered by stray pennies, so I might as well throw those in. It doesn’t matter how quickly the jar fills, just that, when it is full, I can donate coins that probably would have otherwise continued to sit on my car’s dashboard for eternity. It doesn’t take a lot of effort to make a difference. I created an infographic to provide a few suggestions for saving money. The biggest way to save is to use public transportation exclusively. For those who live in cities with good public transportation, it frees up time for reading (or sleeping!) during the commute, and according to the American Public Transportation Association, you could save a whopping $9,000 a year when you cut out auto insurance, gas, repairs, and car payments. Even those who want to keep a car can save an average of $1,400 a year by carpooling. Another easy saving opportunity is switching from bottled water to filtered tap water. It’s better for the environment, and it saves $280 per year. Another option is a small switch from one soda size to another. Ten cents might not seem like much, but added up over a year, that’s $36, and it takes just $30 to give one person safe water for a lifetime. I’m not suggesting you sell all of your possessions and internal organs, nor that anyone gives up their Saturday night ice cream (again, fight me), but a few cents here and there adds up and can go a long way toward transforming lives in rural villages in Niger. If you think you can find even $5 extra a month, why not sign up to become a recurring donor? With a donation of just $5 a month, you can provide give the gift of a lifetime of safe water to two people by this time next year. Tuesday, April 10th is Equal Pay Day in America. The day of the week is significant: it falls on a Tuesday each year because it represents how far into the following workweek a woman must work in order to earn what a man earned the previous week. 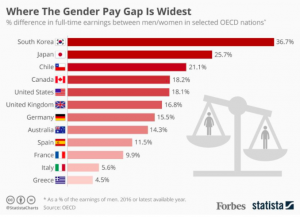 Though there are laws in place that prohibit gender-based pay discrimination (and there have been since 1963), the average working woman in the United States is still paid approximately 80 cents for every dollar a man earns, amounting to an annual gender wage gap of over $10,000. When you factor in race as well as gender, the disparity is even more staggering. Black women who work full time earn 63 cents for every dollar paid to white, non-Hispanic men. That means that Black women have to work for 19 months to earn as much as white, non-Hispanic men earned in a year. 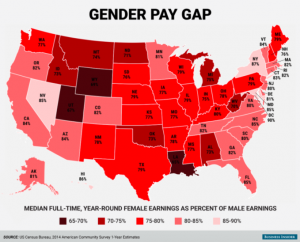 This pay gap exists in every single state, even those that are typically seen as progressive. Pay inequality is a frustration and hardship that women around the world have to deal with on a daily basis. However, in many countries, women’s equality is a secondary concern as they are still struggling in 2018 to meet the basic needs of their citizens: access to food and clean water. 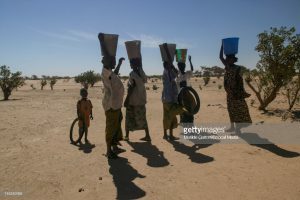 In Niger, women and girls walk miles each day to get water. As a result, girls don’t go to school, furthering the disparity between males and females. The average woman in Niger receives just 4 years of education. At Wells Bring Hope, we are focused on providing access to clean and safe water for the people of Niger. But what makes our organization unique is our continued commitment to the communities where we drill. We focus on improving the quality of life for women and girls. Before a well is drilled, a committee composed of at least half women is established to learn how to maintain it. Once a well is completed, our partner, World Vision, maintains a presence in the village for 15 years to teach basic hygiene, drip farming, and offer women microfinance training. Women are then taught basic financial skills and lead the formation of saving groups that require a small financial contribution in order to participate. Once pooled, the money is loaned out to other group members to help start their own small businesses. Once their business grows, the debt is repaid to then be loaned out to other women, perpetuating the impact women can have on their community. Educating and encouraging women to participate in income-generating activities perpetuates the advancement of their communities, families, and other women and girls. So this Tuesday while you’re reflecting on the struggles women face in our own backyards, I’d like you to also consider the struggle women around the world are facing, including the women of Niger. Gender inequality is a global issue, and with your support, we can tackle it together. It is fascinating to think about the ways that a shared desire to make a difference can have a major impact. The yearning to do something great makes a difference in schools, non-profit organizations, communities, and individual lives around the world every day. Wells Bring Hope is an organization that is run by volunteers, which means this organization would not be able to operate without the cooperative effort of like-minded people. It it is energizing to consider all that can be accomplished in the world by the collective efforts of people demonstrating their basic humanity in a way that is important to them. Every single day, organizations around the world rely on volunteers to help meet objectives and make progress. The progress that Wells Bring Hope has made in Niger is a great example of what volunteers can accomplish. Wells Bring Hope recently reached their goal of drilling 500 wells. 500 wells drilled means that half a million lives have been radically transformed by the life-changing power of access to clean water. The progress has changed lives and wouldn’t have been possible without the shared determination of Wells Bring Hope volunteers. Cooperation and shared purpose play a crucial role in meeting objectives and making an impact. When you have a team of volunteers who share a vision for making a difference, they are unstoppable. As an African Proverb states, “If you want to go fast, go alone. If you want to go far, go together.” Wells Bring Hope will continue to bring hope because of the shared vision and grit of their volunteers. The inspiration to give back is what made Wells Bring Hope possible, and it is the very essence of what makes Wells Bring Hope great. The founder of this extraordinary organization, Barbara Goldberg, heard about the heartbreaking reality of the water crisis in West Africa, and was inspired to act, to give back and build something bigger than herself. The spirit of giving back continues to write the story and successes of this organization. The impact that Wells Bring Hope, a primarily volunteer-run organization, has made in Niger overwhelms me with inspiration. The marked progress this organization has made is substantial evidence that volunteering transforms, not just lives but entire countries. 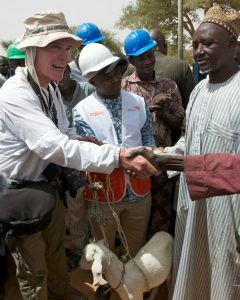 Volunteerism will forever change Niger, and it is the very first volunteer who made it all possible, Barbara Goldberg. Hope, what inspires her and some of her favorite memories. One of Barbara’s favorite memories with Wells Bring hope was her very first trip to Niger. experienced because they now have access to safe water. researching corporate partnerships, creating social media, writing blog posts and more. back to the people we serve, we serve them. They are our motivation for doing the work we do. many, there are two that she chose to share. to see what is before you, accept it, move on and survive. Don’t let life be desolate. gently make a shift in one small way to try and restore the balance. and work to get past and around them and just keep on going. covering the operational costs of our one paid volunteer Kate Cusimano, Director of Operations. Most of us have heard about the major fashion industry events that take place in the recognized fashion capitals like New York, Paris, London, and Milan. Emerging fashion designers flock to these cities in hopes of working with renowned designers, and gaining exposure for their art and talents. We have heard about the cities in Europe and the United States that get the attention of the fashion industry; but there is a “forgotten” fashion capital making up-and-coming designers’ dreams come true – Niamey, Niger. 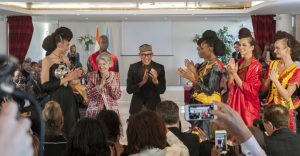 The capital city of Niger is home to the International Festival of African Fashion (FIMA), a four-day runway and accompanying trade show that brings the big names and the newbies from around the world for an amazing collaborative event. Unfortunately, due to the increased terror threats to the people of Niger, the last edition of FIMA had to be held in a closed, secure location in the capital city. FIMA 2016 was a two-day event that once again could bring together aspiring designers, artisans and models from all over Africa to connect with international industry players. The motto of the African fashion festival is “Creativity for Peace and Development in Africa.” Through the efforts of Alphadi and all of the contributors to FIMA, The School of Fashion and Arts was opened in Naimey, giving a new generation of African designers the opportunity to learn and pursue their love of fashion and art. Alphadi has done amazing work to bring awareness to the abundance of talent found in Niger, as well as the growing need for education and resources to continue to produce artists. The time for another International Festival of African Fashion is fast approaching. Here’s hoping that the festival can continue to showcase the arts, fashion, and culture coming out of Niger. The country and its residents have so much to offer the world.